In the early hours of Saturday morning (19th'') a small army of volunteers was mobilised to help to stage one of the UK's premier ultra distance races - the 31st running of the Rowbotham's Round Rotherham Run; this year a qualifying race for the Ultra Marathon du Mont Blanc, the Courmayeur -Chamonix and the Traces du Ducs de Savoie international series . The run loosely follows the boundary of Rotherham, starting and finishing at Dearne Valley College , Manvers and passing through Wath, Thorpe Hesley, Kimberworth, Treeton, Harthill, Woodsetts, Maltby and Old Denaby on an undulating course of 80km (50 miles) with over 800 m of climb. This year the race was made a little more testing with overnight rain making the trail through the woods and fields very slippery in parts. The day started at 5 am with 130 walkers having to check in ready to be sent off on the course at 6am. The 200 runners entered were then registered and faced the starter's gun at 7 am, with 19 relay teams of up to 8 runners each being the last group off at 8 am. The course was manned by yet more volunteers who cheerfully served up cold drinks, fruit snacks, biscuits and jam butties to the participants at 7 relay points distributed around the course and a warm meal at the finish, a service greatly appreciated by all. With the weather improving slowly through the day most competitors were able to keep reasonably warm and dry but the conditions, both atmospheric and underfoot, did mean that almost 100 entrants failed to finish what is a severe test, even for seasoned runners. 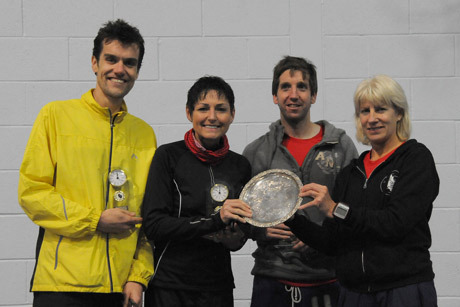 The individual race was won in a time of 6:52:14 by Kevin Hoult (Stadium runners, Huddersfield). Kevin Doyle (Kimberworth Striders 7:03:49) was second man home and Fraser Hirst (Unattached 7:17:13) was third. Nils Hofmann (7:41:09) was first Rotherham Harrier finisher in 11th place overall for the second year running. First lady home was Karen Nash (Fell Runners Asociation 8:21:49) with Joanne Bolton (Kimberworth Striders 8:45:55) second and Emma David (Nidd Valley Road Runners 9:01:03) third. The men's relay race was won by a team from Clowne Road Runners (5:22:26) with Kimmy Kingpins second (5:58:59) and Handsworth Roadhogs third (6:23:14). The mixed relay saw Clowne Boys and Girls home first (6:07:23), Wild Hogs second (6:31:23) and Maltby Marauders third (6:44:17). The women's relay results were Kimmy Kittens first (7:14:50), Women In Black RHAC second (7:30:30) and Clowne Ladies third (8:02:16). Altogether 236 individuals and 17 relay teams completed the whole 50 miles and some showed a remarkable commitment to the race as Roy Varo (RHAC) set a new record with his 26th completion out of the 31 times the race has been run. Henry Marston (RHAC) and Andrew West (Doncaster) completed for the 24th time; Kerry Booth (RHAC) and Chris Sanders (Stafford) finished for the 23rd time.